Probably the best IPA I have reviewed so far. This beer had a great color, aroma and sweet finish. Gritty’s does a great job with their beer and I am sure this would compare well with other East Coast IPAs. With an IBU rating of 60 it has just the right amount of bitterness without being overwhelming. 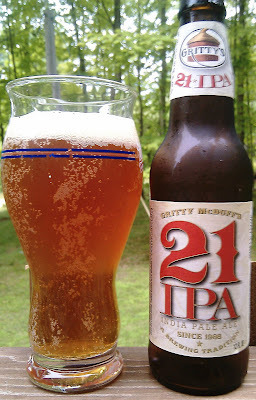 Even if you are not normally a fan of IPAs this one is worth trying. Cons: Slight aftertaste but that is to be expected from an IPA. Brewers Description: Gritty’s 21 IPA is a unique blend of American hops with a British body utilizing English 2-Row Pale malts. This IPA starts with a hoppy aroma and taste; ending with a sweet finish. Plenty of Munich and caramalts are used to give the beer that golden hue. There are fifty-six pounds of Cascade Hops used in each 50 barrel batch that is brewed! Then we finish the beer with Willamette & Warrior Hops, (Warrior is a high-alpha acid variety of hops) All this leads to an IPA that is worthy to celebrate our 21st Anniversary!